Angry Birds Action! APK has been updated to the newer version 2.1.0, this game tells the story of Red who woke up after a party and found the village where he lives shattered. Unfortunately, the eggs that are stored in the village are scattered somewhere that makes Red reprimanded by the village head. The village head was ordered Red and his friends to reinvent the eggs scattered in dozens of levels. If you’ve ever played a physics-puzzle game similar to Go Go Armadillo, you’ll soon be familiar with the gameplay in this game. You can use some characters of birds, such as Red, Chuck, Bomb, and Terence, and then launch them at every level to collect the eggs. Like a carom, the birds can be bounced when in contact with objects and ledges when sliding. Each bird has unique characteristics when sliding, such as Red that hits object and destroy it, until Bomb that explodes when in contact with an object. Different characteristics that made you have to adjust strategies in order to complete the level effective and efficient. The design of Angry Birds Action characters is very similar to the movie version scheduled to be aired on May 2016. By playing this game, maybe we will understand the story and the nature of the birds in Angry Birds movie later. Rovio is not the first mobile game developers that tried to design a game with this kind of gameplay. Previous, Supercell make a similar game with the title Smash Land. However, could not release globally, Smash Land development stopped because they are not able to match the success of other Supercell games. We have added some cool new things! All new bird level system! Collect XP and upgrade your birds to level up your game! Daily prizes – get those oh-so-useful power ups! Daily! For free! Lot’s of tweaks and fixes – we fixed a bunch of issues to make the experience better. 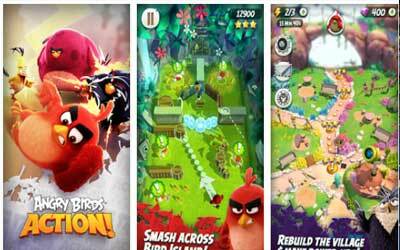 A different way to play from other angry bird franchise. After the update the game works great on my device. But there is small problem on some devices, the lag. Overall, the game is really awesome and addicting.